We spent the first week on the hard breaking into all the projects and finding out what we were really in for. We also got the eager advice of nearly everyone in the yard. 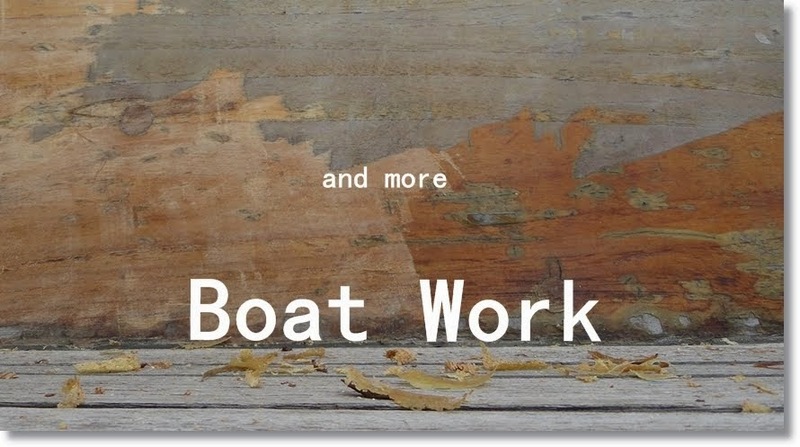 The guys who run it are helpful, and the older men working on their boats are happy to lend a hand to "young people with a plan." Most of them are Vietnam Vets and I'm pretty sure none of them have ever seen a woman in the boat yard. I arrive at 6 before they do and leave well after they've gone home. I don't think they know what to think of me, and certainly don't know what to say to me. It's pretty amusing. The first order of business was to figure out if we could strip the bottom paint ourselves. In some places it just flaked off to the barrier coat. But not in enough places. AJ tested a paint stripper, but it's too many layers of old paint to do any real damage. So AJ took to the grinder. First you have to tent the area to prevent the dust from hitting other boats. This is AJ and a friend after grinding two square feet of the bottom paint. I don't know what kind of suits those are but there was more dust on the boys than on the suits. It ran out of their hair for days. So when we calculated the time, daily suits, masks, and buying ACE out of grinding and sanding pads it's an even exchange if not cheaper to hire it out to the redneck in the yard with a team of Mexicans that have the equipment ready and the means to clean up the disaster zone. And they can do it in a few days, as opposed to a few weeks. They are going to be grinding and repainting the bottom starting Monday. The next order of duty was emptying the bilge of oil/diesel/water. We couldn't dump it into the river, so we had to haul out with it. 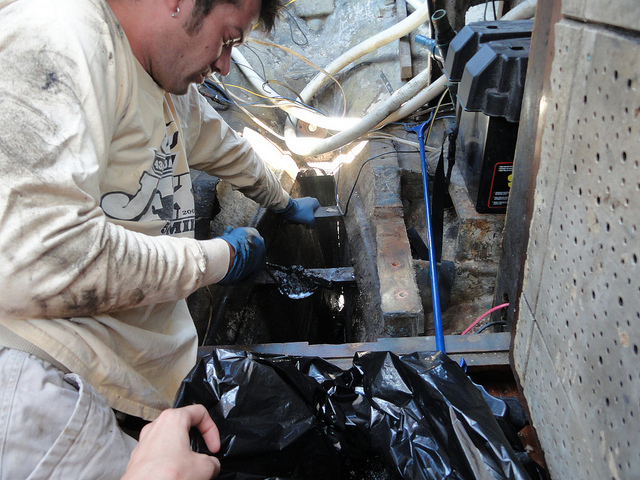 We pulled out the oil absorbers then vacuumed out 30 gallons of water 5 gallons at a time. There is nothing like the smell of old soaking oil/diesel/water sludge to remind you of what it's made of. Dead animals. And that's exactly what it smells like. Like a sewer flooded a mechanics shop. After vacuuming what we could, it was time to play "How many tools can you find in the bilge muck?" The crazy thing was that 30 gallons of bilge water is still so far down the bilge looks almost empty. It has to hold 150 gallons of water. We feel that's excessive and are considering what to fill the bottom with to make it shallower. We may drop lead in the keel to add weight aft. The new engine is half the weight of the old one and we are bow heavy right now with the anchors and anchor chain up front. We have pulled so much crap off the boat that we will likely be sitting even higher on the waterline than before, so we may need the extra weight. 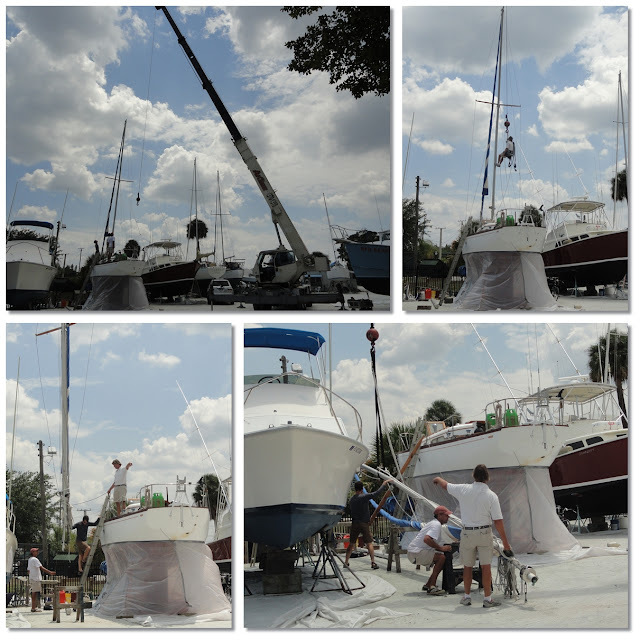 Monday Mack Sails came to remove the mast. 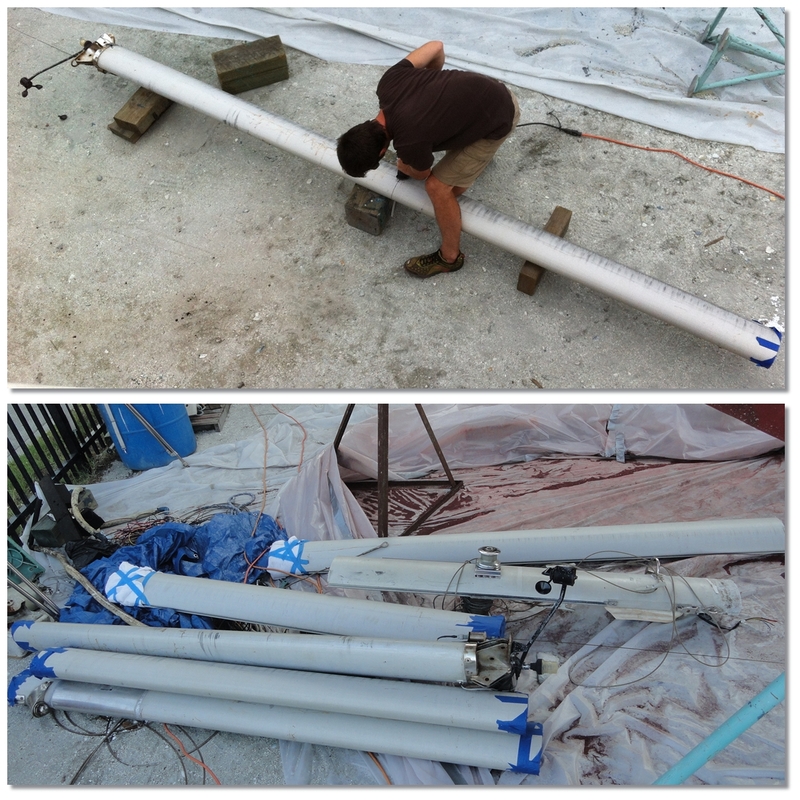 Then AJ stripped it of hardware and rigging, then hacked it up for scrap. The ends are tapped up because it was full of standard packing popcorn foam. 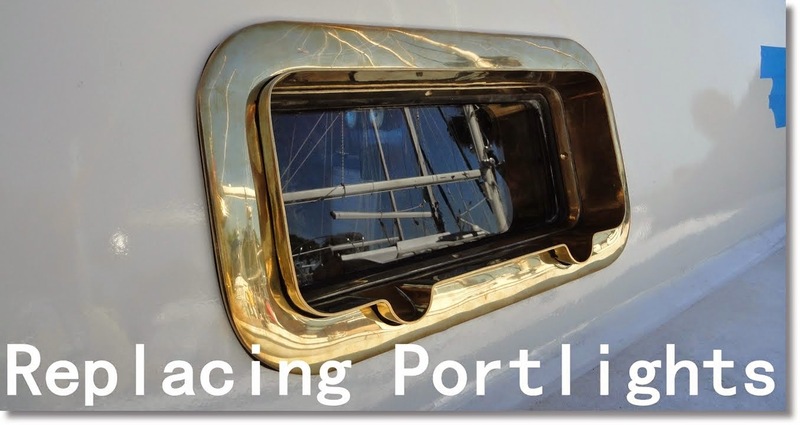 A few days after removing the mast, the cabin had decompressed itself and gotten a touch narrower. You could see the shifts in the trim along the ceiling. Then the mast support blocks slid right out. They are cedar, not teak. Raw, untreated cedar, soft and splitting. No sealer, no glue, no epoxy, not even paint. Nothing but raw blocks shoved under the support wall in standing water. WTF??!! People be crazy. I spent my first couple days tackling the newly emptied cockpit lockers. AJ took out the wood sidewalls so it's open to drain into the engine compartment and bilge. So after the toxic bilge water was emptied and disposed of, I filled it with soapy dirty water. More dirty than soapy. I spent two days in there scrubbing and chipping paint. It's stifling; you're in there with open pores, cleaning chemicals, fiberglass splinters, wood splinters and layers of dirt. In the early days of fiberglass construction the threads of glass used were much thicker than today. AJ found a glass splinter buried in his leg after a week of irritation - that kind of bigger. It's rough and looks like dried snot on the interior hull, making it hard to get a really good sanding. The block on the floor in the left locker is the steering sheave block. Next we need to finish the engine room so the engine can finally be installed. Cleaning it for paint has been a year long process so far. It used to be covered in muck like we dug out of the bilge. But even still, it's far from paint-able. There are chemical products guaranteed to cause cancer and birth defects that will strip the surface like satan's piss. Barely even have to wipe it down after. They run about $20 a bottle, and I believe are the usual course of action. Though we may let the guys doing the bottom job finish up the engine room. We've both spent months in there with toxins already. We'll see. This week I also started cleaning the interior compartments/inside hull bottom. Some previous owner not only painted over dirt here too, but dripped varnish and epoxy everywhere. Quarter inch thick globs in some places. I can't imagine clean glossy wipe-able storage compartments. It will be a different life. While Doing this I got to see where every compartment drains to. Icky as it is, I would not be comfortable not having laid hands on and tended to every nook and cranny of the boat. At the end of this there shouldn't be anything we don't know about it. Here's more dirty dirty hull. My camera likes to make whites white, even when they're not. This compartment is behind your feet on the starboard settee. About 4 feet deep with an 8" tall entrance. Here's the wiring cabinet. The ceiling in there is pretty much what they all look like. Once the decks are stripped of hardware and the blocks and bolts come out they'll get fully redone. Here's one of the chain plates from the inside. The plywood panel trim broke off with the slightest tug. You can see the light coming through the fiberglass. The engine got lifted in for engine mount and shaft fitting. It's so awesomely small. You could not reach your arm around the old Merecedes. And you had to suspend yourself upside down from the boom to access any part of the back. Now you can sit behind it. 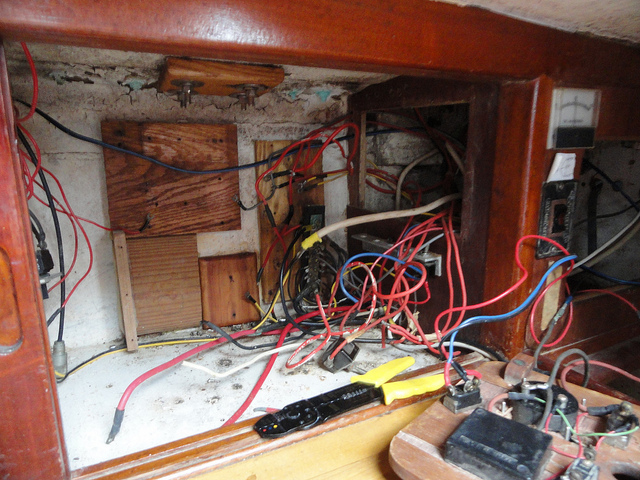 This weekend we are stripped the boat of plumbing, the remainder of the wiring, and the always present superfluous crap. 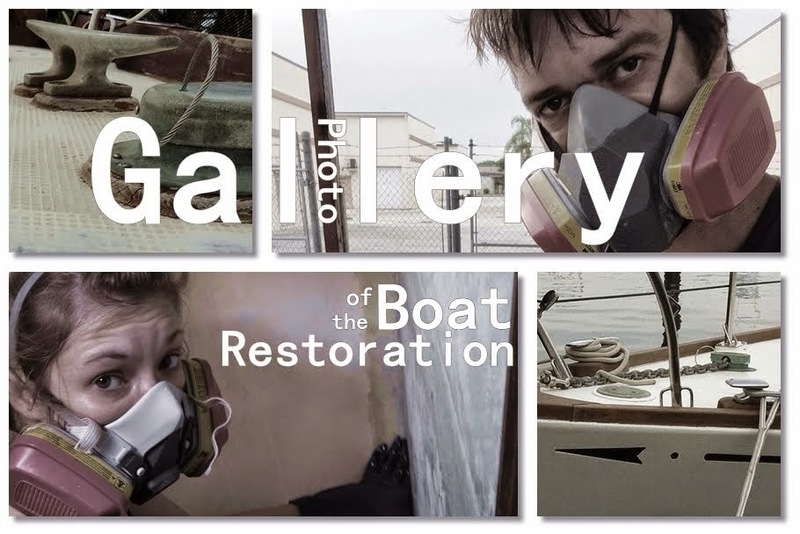 So starting Monday I will have empty, hose-free, wire-free compartments and subfloors to clean, sand, and eventually paint with gray bilge coat. I'm hoping to be able to lightly hose out the compartments for the final wash and watch it all drain. Here are the subfloors. With four gummy filthy filthy useless hoses. The lids on the right are the top of the water tank that was fiberglassed over the bilge. The subfloor would curve down and run into the bilge otherwise. The vertical wall at the bottom of the photo is the separation between the water tank and the bilge. 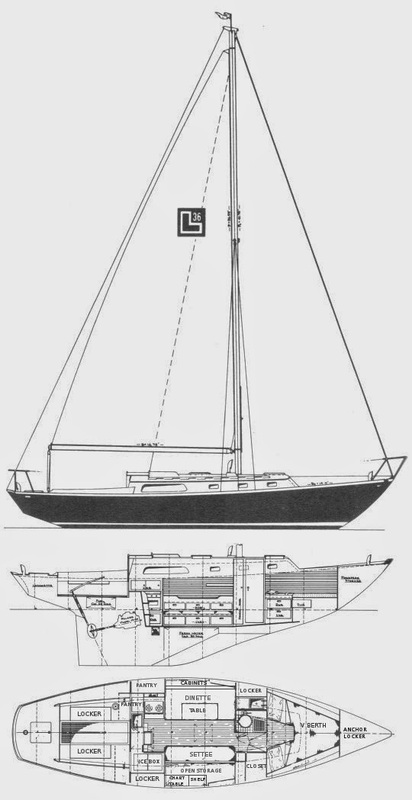 Without the tank, water would run down the sides of the subfloors and into the bilge below - the full length of the keel. Instead water sits on the level subfloor, soaking the keel bolts. All those hoses were meant to drain everything into the bilge, but they did not. Water just became blocked around and under them. The two metal poles of death are the mounts for the table. The 40 lb Mahogany plywood table that's not going back in. It's slants down buckling under it's own weight and there's no knee clearance. It's hard to work around those poles, and hard not to gash your leg open on them. They need to be removed to lift the floor boards there. They are bolted through to an inaccessible extra block of wood underneath. They will probably have to be ground off. What's under the fibgerglass tape that's peeling? dirt. But look! A floor! A floor that won't have any hoses running there when we've re-plumbed. Just a cleanable open subfloor. yeah yeah. That about wraps up week one. It rained part of the day 3 days this week. Back to tarping the engine and cockpit before we leave. The rest of the time it's hot and sunny. There was a spectacular lightening show a few nights ago. Draco, Ursa Minor, and Cepheus are in the sky. Nothing makes me more determined to sail the ocean or more motivated to keep working than seeing the night sky. So much work, but I am so glad you are getting everything is proper, clean, functional, working order. I know it will feel really good when all this is done and everything is as it should be. I love knowing that we are looking at the same stars in the sky - well - as long as you are in the northern hemisphere! Thanks Mark, I'm going to wal-mart now. 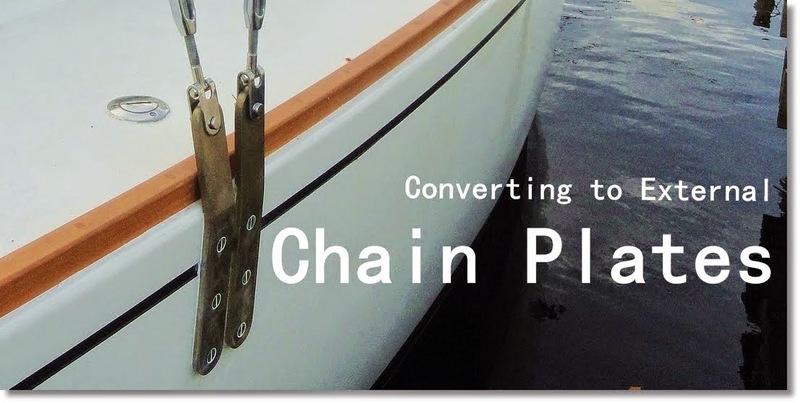 Consider the effects of stowing supplies, especially canned food, when you plan your ballast! Food prices in the Caribean are aboout 2-3X that in Miami and in the Pacific about 10X, and in Indonesia most of what you want is simply not available! For (relatively) dry areas canned goods makes excellent "trim ballast" - heavy yet easy to move in small chunks as needed. We left Miami with approx 1.5 tons of "consumables" on board - about 70% food, Panama with 4 tons (!) and Australia with about 2 tons . We ended up adding bladder tanks for extra deisel or water in "wet" areas, Deisel especially varied from US$0.09/gal (Venezuela) to US$6.00/gal (Tahiti) - 1994 to 2000 prices, probably all X4 or more today. Typical prices were in the $2/gal range. Many places (e.g. Tahiti) would let you have ONE "fill up" just before departure and the "duty free price" (US$1/gal in Tahiti back then). We were able to buy 360 gallons which lasted us almost to Australia. Don't forget that 80% of your diesel will be used for refrigeration! Bottom line - you NEVER have enough stowage! Actually we don't have refrigeration and have not for the last year. We may install it sometime soon, but it will run solely off solar. And it won't be run when it's not needed. Fuel is for coming into port, and emergencies like avoiding weather or rig failure. 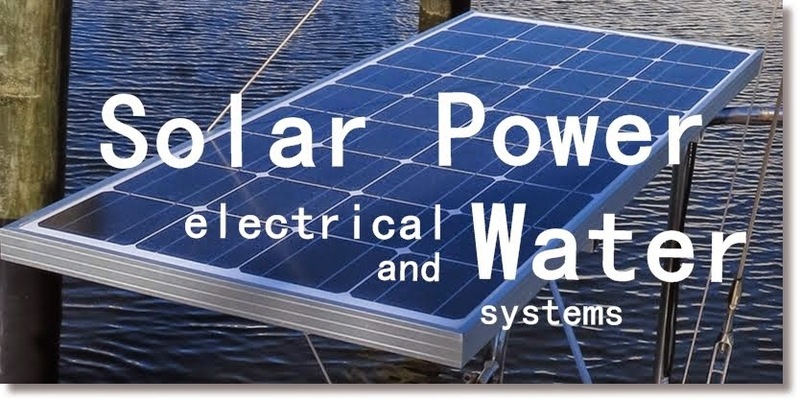 With today's technology, you can run a refrigerator, GPS chartplotter, Radar, and an Autopilot on a couple 4'x2' solar panels with MPPT Smart controllers, and easily carry enough battery power to last 2 days without the sun. "Free" electricity is the replacement for diesel. And not wasting power on things that are not directly life supporting is how we do it cheap. Don't have any illusions. NO ONE ever fixes everything on a boat!! !